Overwintering herbs indoors is a great way to keep fresh flavor on the table all year long. Fresh herbs are the key ingredients to so many delicious dishes. And whether it’s basil, thyme, oregano, or a pinch of rosemary, they can add the right touch of flavor to complete the perfect recipe. But you don’t have to sacrifice all of those great flavors simply because the weather is turning cold. Rosemary potted up and ready for winter use! As the days get shorter, and winter approaches – you can pot up your favorite herbs for wintertime use. With the exception of a few varieties, most herbs can continue flourishing indoors given the right conditions. 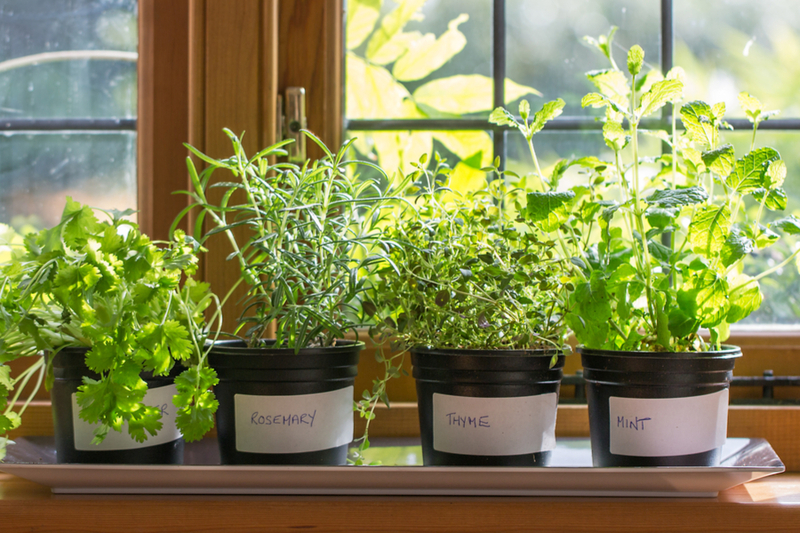 Many all-time favorites, like basil, oregano and thyme need only a sunny window, good soil, and bit of water to grow. Start with a good quality potting mix. Fertile and well-drained soil is a big key to success when growing indoors. Start with a good, high quality potting soil mix. Make sure the pots and containers you will be using have adequate drainage holes. When growing indoors, over-watering and soggy soil is much more of a problem for herbs than too little water. When transplanting existing plants from the landscape for potting up, start by selecting the best of the best. You will always have more success when starting from healthy stock. It is best to dig up and transplant overwintering herbs while temperatures are still warm enough to leave the pots outside for a few days to adjust. Allow them time to acclimate to their new surroundings. Because they will be receiving less light indoors, let them slowly adjust after transplanting. Keep plants out of all-day sun while they adjust. Letting them receive less light now will help them to prepare for life indoors. Here is a look at a few favorites herbs to grow inside this winter, along with specific transplanting and care instructions. Thyme is a relatively low-maintenance herb to grow. It can also be grown easily by dividing from an existing plant, making it perfect for potting up to bring indoors. It is best when dividing to take from the outer edges of an existing plant. These areas will be less woody, with roots that will more easily adapt to potting. Water well, and let adjust a week or so outside before bringing in to a sunny window location. Like thyme, oregano can be grown easily from simple division. Start by digging up the outermost edges from existing plants. Shake off any excess soil around the root ball, and transplant using a high quality soil mix. Keep well watered for the first week after transplanting. An added benefit of bringing oregano indoors is that it is well-known for repelling flies. Rosemary can be one of the trickiest when it comes to overwintering herbs indoors. It requires a fair amount of sunshine, so place in the sunniest window available. A southern-facing window is your best bet. To allow time for rosemary to adjust to indoor conditions, pot up early and bring into a partially shaded outdoor area. Potting up 4 to 6 weeks prior to bringing indoors will give them the best chance for success. Porches or a covered patio will work well for keeping rosemary in limited light to prepare for indoor life. Rosemary does not tolerate wet soil well, so be stingy with watering. Especially once the plant is indoors for the winter. Chives are a perfect way to add a little zing to all sorts of culinary dishes. And they are easy to grow indoors! Chives grow in clumps, and are simple to dig up and divide for transplanting. Once dug up, divide into small 1 to 2-inch clumps for best results when transplanting indoors. Place in a sunny window, watering only when the soil dries out. Mint is one of the most prolific growing plants of all, and can easily be transplanted and grown indoors. In fact, it actually seems as though it takes talent to somehow not get mint to survive! Dig up a small portion of an existing plant, pot it up, put it in the window, and watch it grow! Some herbs are simply easier to grow indoors from seed. Once the plants have germinated, bring them indoors to a bright, sunny windowsill for the winter months. Basil is best grown from seed. This Is My Garden is a garden website created by gardeners – for gardeners! We publish two articles every week, 52 weeks a year. Sign up below to receive them free each week via email, and be sure to follow us on Facebook This article may contain affiliate links.